The Genealogy Gems Podcast with Lisa Louise Cooke - Your Family History Show: Episode 158 - Exclusive Interview with the Producer of TLC's Who Do You Think You Are? Attention Gmail Users:Google has revised the Gmail dashboard to now include tabs, separating your emails based on the type of content. Overall, I really like it, but I wanted to bring to your attention to the fact that your Genealogy Gems email newsletters will probably land in the Promotions tab, rather than your Primary tab. The problem with this is that we are used to focusing on what is in the in box in front of us, and I know I’m having a little difficulty retraining myself to check the other tabs. To ensure that you get your Genealogy Gems newsletter emails instantly, move the newsletter to your Primary tab. Click on the email to grab, drag and drop it on the Primary tab. From that point forward your newsletter emails should show up in your Primary tab, and you won’t miss a thing! 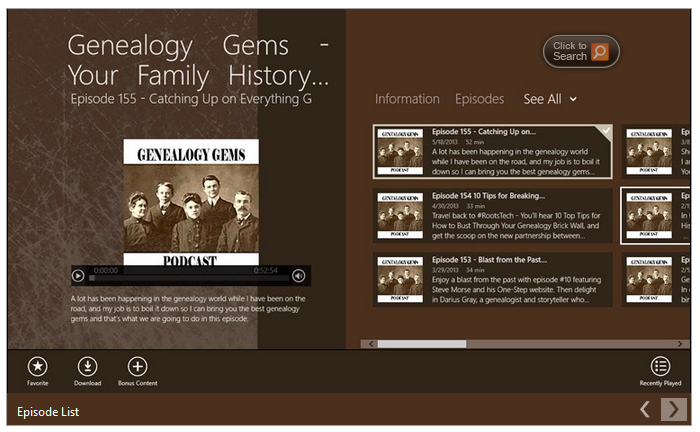 First, download the Genealogy Gems phone app for $2.99 from the Windows Phone Store. Once installed, a live tile will be available on the start menu. Opening the app will provide you a list of episodes available for the show. You can swipe left or right to move through favorites, downloaded episodes, and recently played episodes. Selected episodes will be highlighted with a check mark in the corner. Tapping on an episode you wish to listen to will open an in app player. Clicking on the three dots in the lower right hand corner will open up the menu shortcuts, giving easy access to marking episodes as favorites, downloading the episodes for offline listening, or sharing the episodes out with your friends. Opening the app will provide you a list of episodes available for the show on the right with a player on the left and utilizes all the standards of the Windows 8 navigation. Selected episodes will be highlighted with a check mark in the corner. An episode can be bookmarked by marking it as a ‘favorite’, and episodes can be downloaded so that they are available offline. When downloading a file, the status of the download will appear. Once an episode is favorited or downloaded, you can set the app to show only those favorite episodes or those downloaded files. You can also view a list of what episodes were recently played. 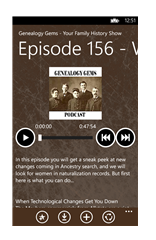 The Genealogy Gems Podcast app is the one and only family history podcast app available, and was named a Must Have Apps for Hobbies by App Advice. Now when you discover an ancestor's record on Fold3.com, you can save it to your online tree at Ancestry.com. "You’ll be asked to log into your Ancestry.com account, and then you’ll see a drop-down list of your trees. Locate the tree you wish to save the document to, begin typing the name of the person to whom the record should be attached, choose the correct name from the list that appears, and then press save." The patron catalog on FamilySearch.org is renamed the FamilySearch Catalog. It is re-branding of the FHL Catalog. FamilySearch is planning to load their catalog records into WorldCat by the end of the year. In the case of our very larger records, these may be abbreviated. Patrons discovering their catalog records on WorldCat will be able to click through from WorldCat to the FamilySearch Catalog to view the complete record. WorldCat will eventually show holdings in selected regional family history centers as well. There are currently no plans to change circulation policy. Films can be ordered to FamilySearch Centers as before. Other materials are not circulated. However, they are scanning their books and have over 80,000 of them on line. There are links to them in the catalog. They can also be searched on Familysearch.org by selecting “Books”. If you've been doing family history research for a while, you probably have heard of (and maybe used) PAF: Personal Ancestral File software. Well, it's been hard at work for a long time--as a true pioneer in genealogy computing--and now it's retiring. It's not that your PAF software suddenly doesn't work. But as of today, July 15, 2013, you won't be able to get downloads, supports or upgrades from FamilySearch, which has made the software available since 1984. What does that mean for PAF users? The current version of PAF supports exports to GEDCOM files, still a universal file type for genealogy software. So while GEDCOMs still remain supported on other software and online family tree hosts, you'll be able to transfer the data from your tree. Those who want to continue to use FamilySearch products (like Family Tree) are advised by FamilySearch to switch to software that partners with FamilySearch: Ancestral Quest, Legacy Family Tree or RootsMagic. Learn more about the PAF discontinuation, what it means to you and supported software options at FamilySearch. 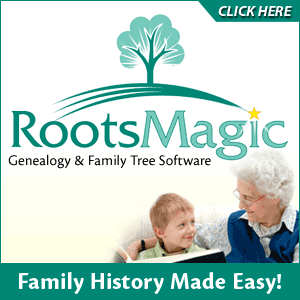 If you're a RootsMagic user (or may be interested in becoming one), FamilySearch Family Tree or PAF user, you'll love these helpful tutorials. And let your voice be heard: They are even taking suggestions for topics to cover in future short videos, too! email them at support@rootsmagic.com. Because there is such a strong genealogy interest in the LMA, they are making a huge effort to reach out to genealogists. They're all about educating us and sharing what's at LMA through their website, hands-on classes, remote research services and partnerships with data sites like Ancestry and FindMyPast. All this from a city archive! Were Your Ancestors "Vicious" or in "Chronic Want"?London Poverty Maps Map It Out! According to blogger Linda Elliott, "Booth employed a team of social investigators who walked around the London streets often in the company of the local policeman and recorded what they saw and heard. The notebooks that they filled out can be viewed online and make for fascinating reading with amongst other findings they record what the policeman thought of each street and sometime each building and its inhabitants." “I just listened to your most recent show and wanted to comment on the Ancestry.com search updates you discussed. I'm sure you have a direct line to them and wanted to offer some suggestions they might be able to use. First, and I think you may have mentioned this specifically, it would be nice if there were a way to exclude certain records from a search, either automatically or by selection. In particular, I am thinking that if I have a 1920 Census record attached to a person, there should be some way to exclude 1920 Census results from a search. Clearly that is not a record I need if that person already has one attached. Secondly, and related to the first, it would be nice if there were some "level of confidence" or other rating one could apply to a record match. That way I could attach a record to a person with no confidence but still have it reference a certain person, or with a moderate confidence or high confidence. UPDATE: Genealogy Gems Toolbar has been discontinued. “I wrote to you several months back to tell you about my new family history blog, "My Descent into Descent", (http://mydescentintodescent.blogspot.ca), and how you inspired me to create it. Well, you've also inspired me to use my new iPad, which my husband gave me for Christmas, as a tool for my research, and now for blogging. Recently, my sister and I took our long-awaited "Family History Road Trip" to New England, and I took my iPad along to blog from the road! I also brought along a keyboard, and would blog in the morning, using the Blogger app, while my sister and niece were still asleep. It was fun to share our experiences almost as they were happening, as well as the crisp and clear photos I was taking with my iPad. As my sister was more interested in the stories from our mutual family tree and less in the research, we tried to plan our trip to include destinations which would interest us both. As I have discovered that we are Mayflower descendants, one of the places we visited was the Plymouth Plantation in Plymouth, Massachusetts. As you may know, it includes a near authentic replica of the village of Plymouth circa 1627, and has actors portraying the roles of the people living there that year. They are well-versed in the stories of the pilgrims they are portraying, and stay in character while they are conversing with you. I was hoping I might run into an actor playing one of our ancestors, but I couldn't believe our luck! Of the handful of actors we met, two were portraying our ancestors, Hester Cooke and Richard Warren! Who actually gets to talk to their long departed ancestors on a family history road trip? Leigh has a new genealogy blog! “I just wanted to let you know that I've been listening to your old Podcasts and working my way up to the present. I'm on Episode 80 now, and I'm learning so much from you. It has never occurred to me to start a blog, but after listening to your advice on the subject, I finally decided to give it a whirl. I mentioned you and your Genealogy Gems podcast in the post and linked to your page. I've heard you say that you appreciated that on previous podcasts, so I thought it would be okay. If you'd like, you can view the blog at http://thesegenesfit.blogspot.com/ . I love your podcasts, and once I'm caught up, I'm planning to become a Premium member. Thanks for pushing me out of my comfort zone!" GEM: Behind the Scenes of the TV series Who Do You Think You Are? It was a sad day when NBC cancelled Who Do You Think You Are? here in the U.S., but genealogists are now drying their eyes and grabbing their popcorn because it’s returning to TV this month. The TLC channel has picked up Who Do You Think You? and the first episode featuring singer Kelly Clarkson premieres on July 23, 2013. Here to tell us all about it is Producer and Research Manager for the series Allie Orton. She’s a graduate of the University of Southern California, and began work as a researcher on the first U.S. season of "Who Do You Think You Are?" back in 2008. In her current role she oversees research development, coordinates communication between Ancestry.com and the research staff, and shepherds these compelling stories to completion!